Metro: Last Light is a shooter. But it's nothing like a Call of Duty, and developers 4A Games resent that comparison. 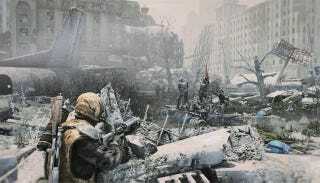 Metro: Last Light is much more about an Eastern perspective on a post-apocalyptic, everything-went-and-got-crazy world. Mutants large and small still terrorize Moscow, as they did in the first Metro title. And I imagine they're pretty pissed that—Metro 2033 spoilers—you nuked them in the previous game. Fast forwarding after the events of the first Metro title, Last Light shows a defrosted world, with weather change seeing occasional rays of sunlight and rain. Not the kind of refreshing rain that's fun to stand in and stomp your rain boots into, mind you. More the kind that can burn through your gloves as they're gripped around the handle of a shotgun prepared to shoot psychic mutants with. So Moscow is still pretty much a dilapidated, mutant-infested hellhole, but at least it's a somewhat sunny one. Many of the Metro game staples have transferred over to this new title. Things like surviving off of gas masks—kept track of by a timer on your watch—and recharging your headlight are still present. But there are a few additions that help immerse you in the dire world where survival seems bleak. Spiders and bugs will splat on your mask, and Artyom will wipe the smeared blood and goo away. Your ears ring with the sound of close-range gunfire and lightning strikes. He still hunts desperately for oxygen replenishments and ammunition, too. As Artyom and his new companion—Pavel—explore the calamitous outdoors, they stumble on a plane wreckage. Pavel says he's heard of the tall tales of souls trapped on the rusting plane. Unfortunately for the two soldiers they're not so tall, and Artyom starts to have shooting visions obstruct his sanity. After a vision of the plane crash, where the pilots witness grand explosions signifying the start of war, Artyom comes to and sees Pavel still in the clutches of a similar hallucination. Artyom is less susceptible to the mutants' effects, so he's able to help his companion come back to reality before he suffocates from removing his gas mask. When we first met Artyom he was young and loyal. He's grown a lot through his experiences in the metro of Moscow, and Metro: Last Light will see this expand and unravel a character impacted by the events of this world that's been burned to the ground. THQ's head of global communications, Huw Beynon, explains that Last Light will have a much stronger, well-executed focus on stealth and story. A 15-minute hands-off demonstration is hard to penetrate that, but I'm creeped out enough by this world to look forward to seeing more.